Home advertorial Press Release: Paw Patrol, Ready for Action! Press Release: Paw Patrol, Ready for Action! Do you have any plans this coming weekend? 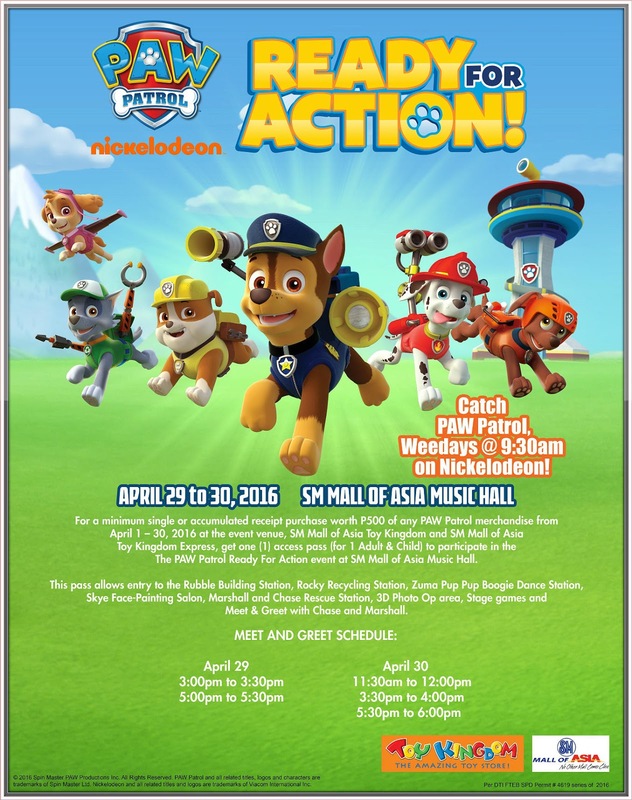 If you are looking for a best place to weekend, why don't visit Music Hall at Mall of Asia for the Meet and Greet Paw Patrol starting this Friday, April 29 until Saturday April 30 at 3pm. The stub will serve as the ticket to enter the Paw Patrol Ready for Action Event on April 29 or April 30, 2016.• One stub can accommodate one child and one adult. Registration time is 2:30pm to 3:00pm• Photo opportunity with the Paw Patrol characters will be done on a per batch basis. Total of 3 to 10 individuals can be accommodated every 3 minutes. Maximum of 100 individuals can be accommodated per Meet & Greet schedule. • Should there be more than 100 people in line, they will be prioritized for the next meet & greet schedule of their choice.